I have been invited to present at a training event for the Red Cross next month. The 2015 Disaster Mass Care and Logistics Institute will be held at West Chester University in West Chester, Pennsylvania, on June 4- 6, 2015. Hosted by the Mid-Atlantic Division of the Red Cross, they are expecting approximately 100 participants from South Carolina through New England. The audience will be composed of Red Cross staff, volunteers, partners and stakeholders. The intent of the training is to prepare the participants for the upcoming hurricane season. The panel on which I will present will focus on large scale disaster responses similar to events such as Hurricane Sandy. 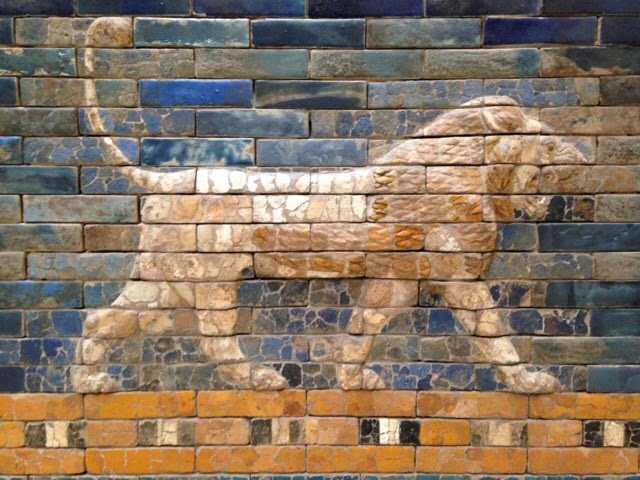 This post is a preview of what I intend to talk about during my presentation. The statements that I make here apply to coordinating a mass care services response at the state level when affected by a large, federally declared disaster that overwhelms the capabilities of the state. Red Cross staff receive a morning brief from Eric Jones (r) at the Disaster Relief Operation in Manhattan during Sandy. The public now expects a World Class, Olympic Gold Medal response for every disaster. This is the new standard to which we all must aspire. We're not going to be able to modify this standard so we have to do the best we can to plan, train and exercise ourselves to success. The state mass care response works better when the responding staff operates in accordance with well understood and rehearsed operational procedures. During the State Hurricane Exercise in Tallahassee last week the Emergency Support Function (ESF) 6, Mass Care staff practiced using our procedures in response to a large, federally declared disaster. 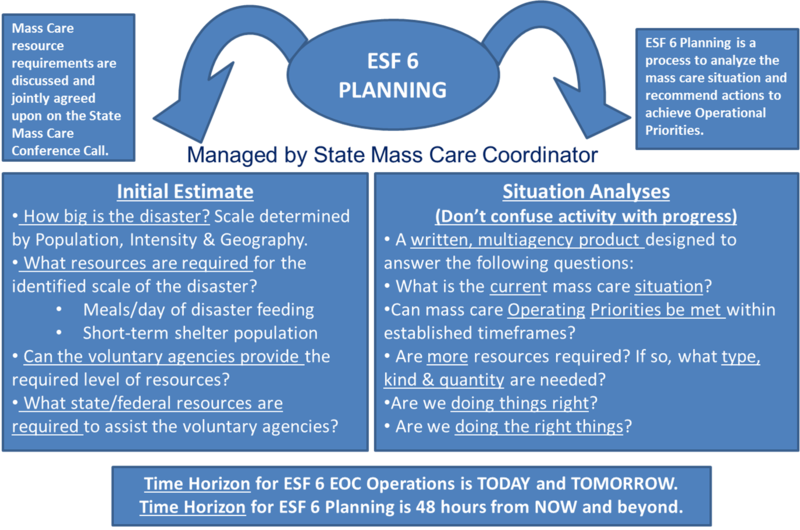 The State ESF 6 Standard Operating Guide (ESF 6 SOG) divides the work into Operations and Planning. Most of the ESF 6 staff in the EOC performs Operations related duties. The Time Horizon of the tasks that they are performing are for TODAY and TOMORROW. The ESF 6 Planning tasks are managed by the State Mass Care Coordinator. The Time Horizon for these tasks are 48 hours from NOW and beyond. 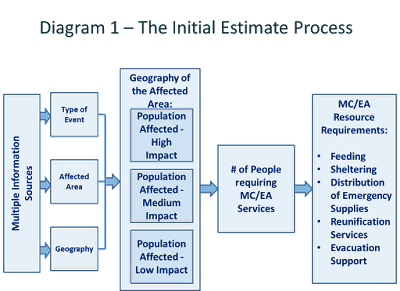 The diagram below, reproduced from the ESF 6 SOG, lays out the two critical tasks related to ESF 6 Planning: the Initial Estimate and the Situation Analysis. A state can call these tasks by different names and use their own processes to complete them but they must address these tasks because they provide the answers to two fundamental questions faced by the State Mass Care Coordinator in a large, federally declared event: 1) Do I have enough stuff? and 2) How are we doing? Question #1 addresses whether there are sufficient resources (personnel, equipment, teams and supplies) on hand or en route to feed, shelter, distribute supplies and reunify families in the affected area considering the size of the disaster. If the answer is YES then the State Mass Care Coordinator monitors and reports. If the answer is NO then she needs to do something about it. The way to get to YES/NO is to use the Initial Estimate Process (see diagram below). 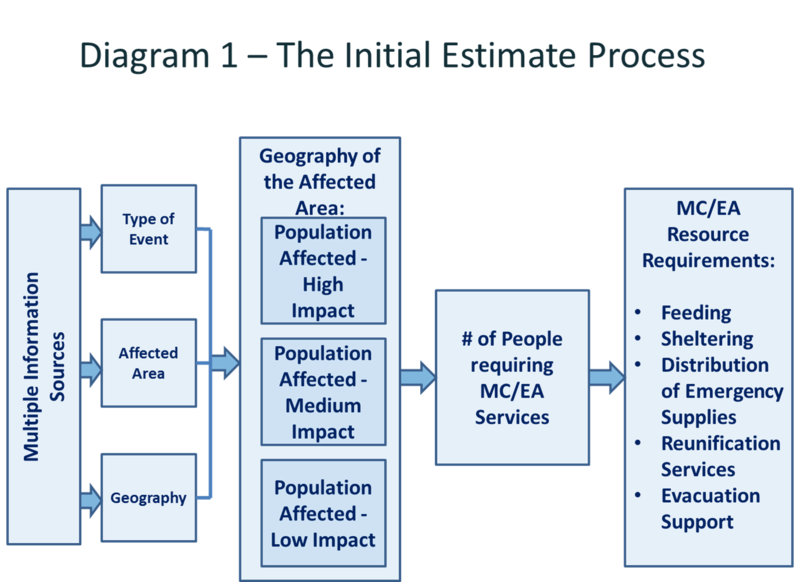 This diagram comes from a brand new FEMA course that has been in development for over 5 years. The course, called the Mass Care/Emergency Assistance Planing and Operations course, is 2.5 days long and will go a long way toward standardizing how we approach the state response to large, federally declared disasters. Every state should be talking to their FEMA Region about scheduling this course in a convenient venue. Once the State Mass Care Coordinator finds out whether the answer to the first question is YES or NO he can direct attention to answering the 2nd question: How are we doing? If you want to know how you're doing you have to know where you're going and when you expect to get there. In most disasters when asked how we're doing we point to the number of people fed or sheltered, two reports that are readily available in most disasters. But activity doesn't signify progress. During Planning we need to define our Operating Priorities, the outcomes expected from those priorities and a metric to use to gauge our progress. When the disaster starts we agree on dates at which these outcomes will be accomplished. The table on page 13 of the ESF 6 SOG shows the Mass Care Operating Priorities, Outcomes and Metrics that we have assigned in Florida. States should work with their partners to establish priorities, outcomes and metrics suitable for their jurisdiction. How is the State Mass Care Coordinator supposed to be figuring out all of these estimates and metrics in the middle of what is likely to be the biggest disaster of her career? To get the job done at the Olympic Gold Medal standard that is expected she needs to bring in more staff through mutual aid as well as the voluntary agencies and FEMA. How are all these new people going to be organized and put to good use? They will be grouped into mass care task forces, by function. For the last 3 years the national mass care community has been conducting National Mass Care Exercises (NMCE) in order to figure out how to organize these task forces and integrate them into the state mass care coordination process. This year the NMCE will be held in Austin, TX, June 7-11. Next year the Exercise is planned to be held in Missouri. The role of the mass care task forces is to assist the State Mass Care Coordinator to perform the necessary planning and coordination. The diagram below, extracted from a document entitled White Paper – Mass Care Task Force Structure and Function, shows the different actors in the state coordination process and how they are supposed to interact. The key word in that last sentence is "supposed." This state coordination process is not only complex but new and not totally refined. We're doing better with each exercise and we hope to improve our understanding of the process even more next month in Texas. This state coordination process diagram does show some concepts that I have previously laid out in this post. The tasks in this process are divided between operations and planning. The mass care task forces perform coordination and planning under the direction of the state mass care coordinator. The objective of this process is to acquire, prioritize and allocate resources and information to the Supported Agencies. A concept that has been difficult for many people to grasp is that when the disaster comes the task forces will be staffed primarily by personnel brought in from out of state. The affected state has little choice in this matter because all of their available mass care personnel will be swept up in the response. There are few people in the nation with the knowledge, expertise and experience to work in a mass care task force during a large disaster. But with every NMCE we conduct the pool of people who are familiar with the proposed state coordination process grows. To further grow this pool of mass care specialists we must standardize the organization and processes by which we run these task forces. Once standardized, and we are achieving that goal with every NMCE we conduct, we can teach a growing cadre of mass care Jedi Knights so that they will be available to respond to requesting states when the Big One hits. 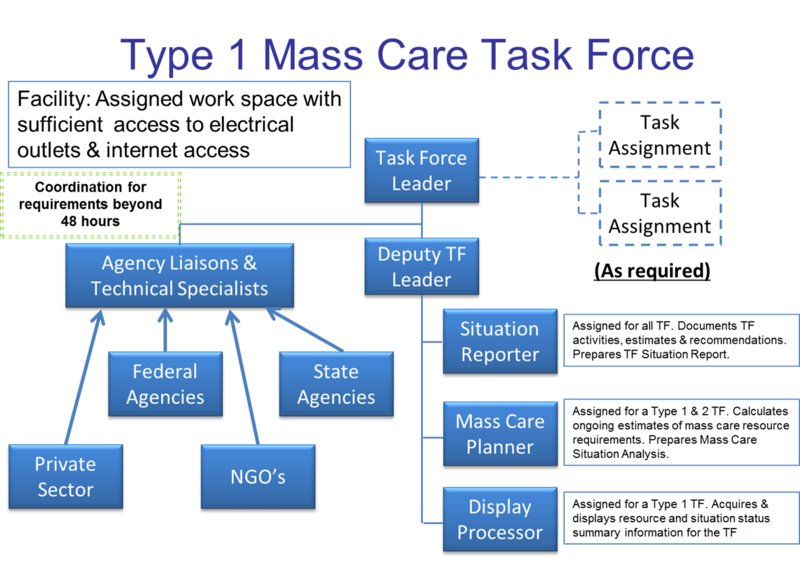 The diagram below, from the same White Paper, shows a sample organization for a mass care task force. 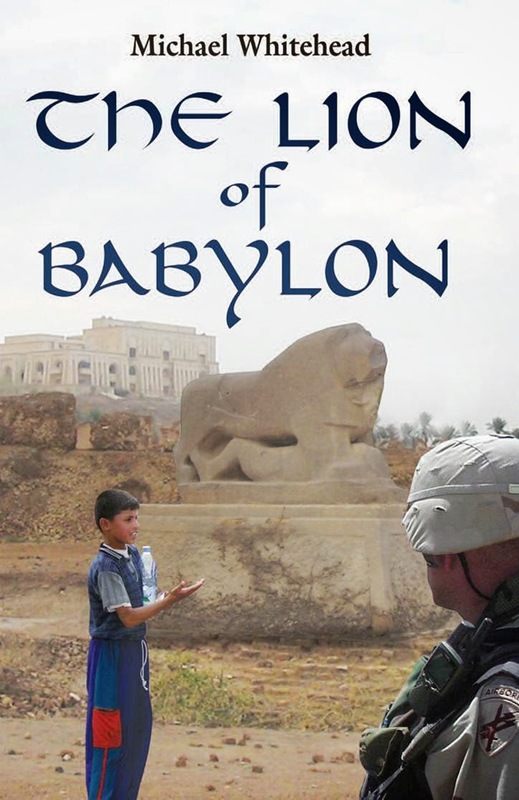 This organization was incorporated into a Generic Mass Care Task Force Operational Procedure that can be utilized by responding task force leaders who arrive to assume a position in a state that does not have their own procedures. Right now, that is the situation in most of the states in the nation. 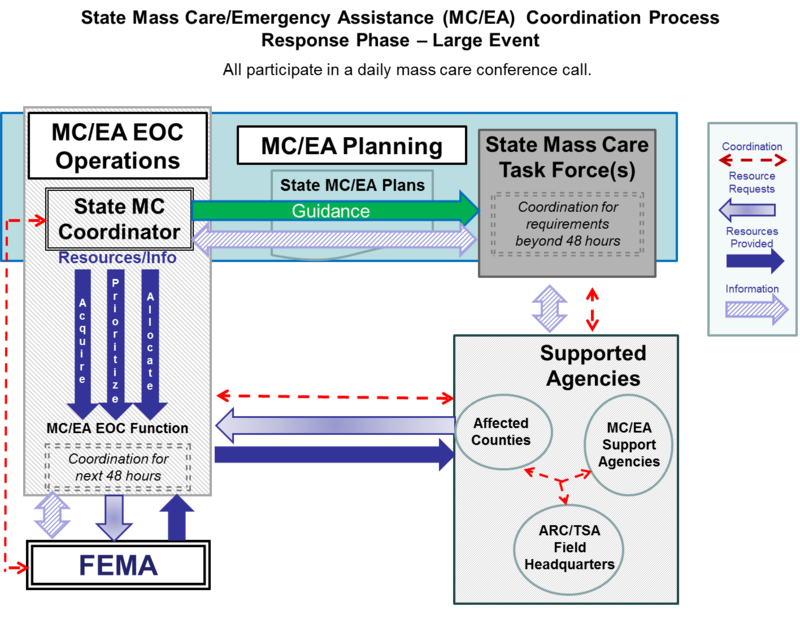 As you can see, state mass care coordination in a large, federally declared disaster is not a simple process. We have made a lot of progress but we still have a long way to go. To facilitate the way forward three things must happen: 1) States must identify a State Mass Care Coordinator, 2) the new Coordinators and their voluntary agency liaisons need to be trained in the FEMA MC/EA Planning and Operations Course, and 3) Trained State Mass Care Coordinators must be given priority by FEMA Headquarters for funds to travel to future National Mass Care Exercises. With the proper encouragement I see no reason that the national mass care community cannot get this done.